Hundreds Of Hateful Incidents Reported After Trump's Victory : The Two-Way Students in Michigan chant "build a wall" at classmates; in Los Angeles they taunt a child about deportation. Reports of hostile behavior toward minorities and women have surfaced since the election. 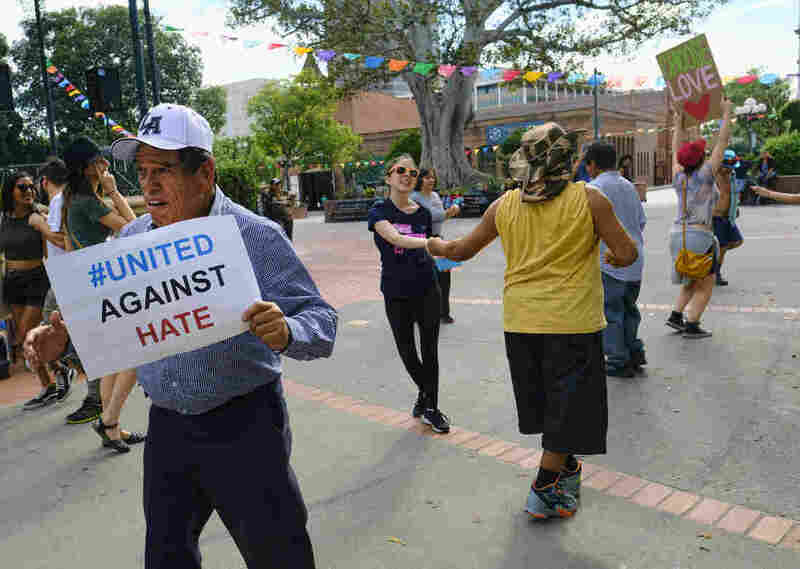 A man carrying a sign that reads "United Against Hate" dances with other demonstrators during a protest against President-elect Donald Trump in Olvera Street's Plaza in downtown Los Angeles on Saturday. Michigan middle school students chanting "build a wall" at Latino classmates. A woman speaking a foreign language on a San Francisco Bay Area train being called an "ugly, mean, evil, little pig." A Los Angeles student reportedly being teased that she was going to be deported. Since the presidential election, reports of intimidating and aggressive incidents toward minorities and women have surfaced across the country. The Southern Poverty Law Center, which monitors hate incidents, has recorded more than 300 such reports in the past six days. SPLC spokesman Ryan Lenz tells The Two-Way that they "span a number of different sorts of ideological motivators," including anti-black, anti-immigrant, anti-Muslim and anti-woman attitudes. Rights groups have called for President-elect Donald Trump and other politicians to take a strong stand against intimidation. "After a long campaign in which various ideologies from the radical right were given a direct conduit into the mainstream of American politics," Lenz says, "it seems that with the election of President-elect Donald Trump, that these ideologies and those who adhere to them feel that they are legitimized or authorized in some way to act out in the public space where previously they existed only online." The only other comparable moment in this country since the turn of the 20th century was the flood of anti-Muslim incidents immediately after the Sept. 11 attacks, he adds. Trump was asked in a 60 Minutes interview that aired Sunday night about the widespread reports. He said he was "saddened" and called the reports "terrible." Looking into the camera, he told the perpetrators to "stop it" and vowed to "bring this country together." But a major political appointment on Sunday might fuel divisions: Trump tapped Stephen Bannon as his chief strategist. Bannon has served as head of Breitbart News, a far-right media outlet that has been a platform for the so-called alt-right movement, which espouses white nationalism. The SPLC says it hasn't been able to independently verify all of the recent reports. And it's worth noting that "some anti-immigrant and other bullying stories are spreading unchecked on social media," as NPR's Kirk Siegler reported, "but there are a growing number of confirmed investigations into alleged harassment and hate crimes." For example, a diverse Episcopal church in Silver Spring, Md., found racist graffiti scrawled in several spots prior to Sunday's services, member station WAMU reports. The messages read, "Trump Nation Whites only." In Philadelphia, the Anti-Defamation League says swastikas combined with pro-Trump graffiti were discovered last Wednesday on an abandoned storefront. Many of these reports are coming from school and university campuses. At Minnesota's Maple Grove Senior High School, a bathroom stall was said to have been defaced with "#whitesonly," "#whiteamerica" and "Trump," among others. "Students say they now worry about going to class," according to a local CBS affiliate. In a letter to parents, the school's principal said he was "horrified" and that it "goes against everything for which our school stands." At San Diego State University, a student was walking in the stairwell of a parking structure when two men confronted her and robbed her, according to the police report, which says the men "made comments about President-Elect Trump and the Muslim community." Many school districts around the country are proactively providing support and counseling to students, while trying to open up a dialogue in classrooms. "We must ensure that our students feel safe by providing safe and respectful learning communities," Boston Public School Superintendent Tommy Chang said in a letter to parents the day after the election, as The Washington Post reported. In another letter sent the same day, Denver Public Schools Superintendent Tom Boasberg told parents, "We encourage students, families and educators to talk, to create safe spaces where hopes, fears and differences can be raised — spaces where we can challenge each other to reach common ground on issues that divide us." A third-grade teacher in Philadelphia is responding by leading her students in anti-racist, empowering affirmations, as NPR's Eyder Peralta reports. "I can do anything I put my mind to," the students say in unison in a video that has been viewed 3.2 million times. Teacher Jasmyn Wright posted the video on Facebook and says that ultimately, it's up to students "to face adversity and defeat it." Larry Ferlazzo of Sacramento, Calif., asked his students, who include many immigrants, to write letters to Trump himself expressing their fears about the election. Several of the notes were published by the Post. "During the election, some of the things you said made us feel really bad for myself and my family and others. It really made me cry," says one student from Afghanistan. "My family and I hope you will be nice and don't be racist and love us back."